I wanted to share some very sad news today. My grandmother (on my mom's side) died from a heart attack recently. With the heaviest of hearts we were forced to say goodbye to one of the most beautiful souls the world has ever known. She touched so many people, and after some time of reflection and recollections of love and laughter, my mind is a little more at peace, but I still feel the need to say something, though nothing I write can do her justice. For as long as I remember, we'd discuss this day coming, in her presence. We'd joke about how the entire city of Isfahan, Iran, would crumble without her, how she's truly the backbone of everything our family is, does. She was such an extraordinary woman who did extraordinary things. Nearly 20 years ago she started her own "bank" for a few hundred extended family members — a way to borrow money interest free since there are always times when someone is struggling and could use some extra help. She created a board for her organization (three female family members she monitored very closely — her speciality) but managed all the finances and monthly meetings. She managed our world. Every shop, cab, bank we'd go to in Isfahan, someone knew her. Growing up spending summers in Iran I swore she was famous — when a stranger asked who I was and I said my grandmother's grandchild, they'd light up immediately; at the grocery store they'd tell me not to worry about paying, that they'd just add it to her tab, she was good for it. She helped put strangers through college, have new clothes for the year, have a birthday party when they couldn't have otherwise. She was a source of spiritual guidance for so many. For her own siblings, children and grandchildren she was everything. And to her, they were everything. 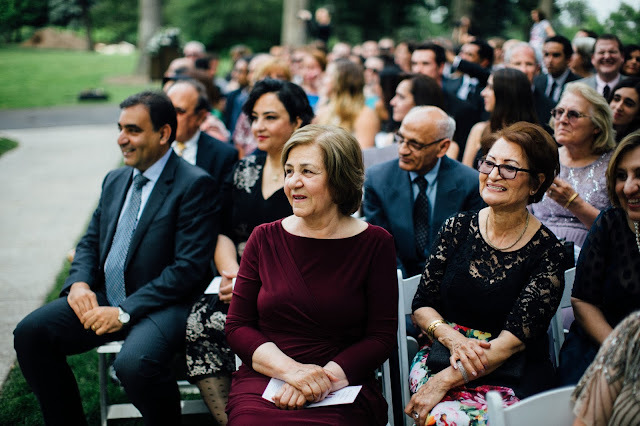 Despite not being well, she made the 24-hour journey to attend our wedding last summer, and while feeling she should be close to her doctors at home, she stayed in the U.S., by herself, for months after the wedding so my mom wouldn't have to be alone. Despite not having much of her own to give, her gifts were always beyond generous, and while she was always thousands of miles away from me and my siblings on holidays and monumental occasions, we were never, ever forgotten. I've never known and will never know someone more selfless, more kind. My favorite thing about her, which my dad wrote in a tribute that was read at her funeral, is how intelligent and opinionated she was and yet still so respectful to others' beliefs, never letting differences come between her and others, whether it be strangers or those she loved. A strong Muslim, she prayed five times a day. When she visited us, my dad, not religious himself, often challenged her on why she did this, why she was getting up to go upstairs and recite the same thing when her weak legs made the chore so difficult. She'd smile and explain why she had to, while assuring him that she respected his decision to stay downstairs. She also happened to be visiting us when I went on my first date with Brian, a concept that isn't very common in Iran. I remember coming home and telling her about it, and when Brian texted me when he got home, showing her the texts. We dissected them together, and as my relationship with Brian began to develop in the following weeks, she'd impart wisdom I was too naive and stubborn to believe (she was right, of course, about it all).